Some have wondered, how is it that a young Italian Saint that never even saw an airplane could possibly become the official patron Saint of Italian Paratroopers/Parachutists? Gemma in fact had died 8 months before (April 11, 1903) the historic flight on December 17, 1903, when Orville Wright piloted the first powered airplane 20 feet above a beach in North Carolina. How is it that the heroic body of the Italian military paratroopers, the airborne elite, began to invoke the special protection of Gemma and eventually come to officially request the Catholic church authorities to proclaim Saint Gemma as their heavenly patron? During World War II in the years 1941-1942, there was established in Tarquinia, Italy an elite military paratrooper school known as the Folgore division, who later became notorious for the heroic valor in the battle of El Alamein. The Passionist nuns of this village were asked by the military to sew and embroider the military badges of the Paratrooper Corps onto their uniforms, along with the varying badge-degrees of the respective jumper. While doing so, the nuns contemplated the grave dangers and risks to which these young heroic men would soon be exposed to, and they soon decided in their "spiritual-motherly" care to began to take the liberty of sewing into each paratroopers uniform a holy card with relic of St Gemma (who incidentally has just been declared a Saint on May 2, 1940). In doing so, they recalled the holy life of Gemma whereby she had been saved by her guardian Angel from the grave dangers and traps wrought by the devil during her lifetime, and with this in mind, they called upon her to protect these young men in their dangerous maneuvers. This act of love and kindness by the nuns was soon met with great appreciation and thanksgiving from all of the heroic jumpers at paratroopers school. Wearing her relic sewn within their uniforms, the young soldiers began to feel a special devotion for their new heavenly protector, and within a short time they all decided to formally request the Postulator General of the Passionists in Rome to officially declare Gemma as the Patron of Paratroopers. However, for many years the Italian Paratrooper Corps had already had for their heavenly Protector the Madonna of Loreto, so it was decided that they should honor and invoke Blessed Virgin of Loreto together with St. Gemma, and so it would be that the Blessed Virgin Mary and Gemma who would together become their heavenly protectors. 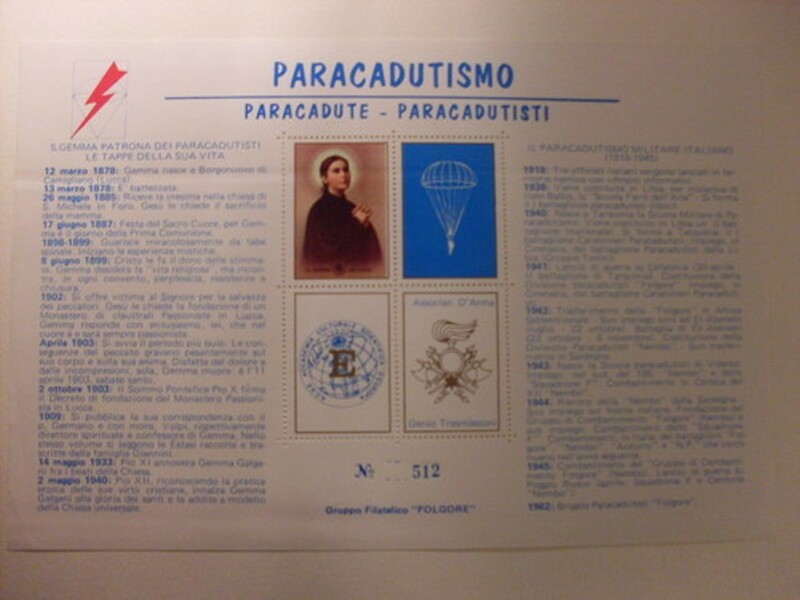 As a special gift to the heroic young men of the Paratrooper Corps, the Postulator General of the Passionists then had medals coined with a stamped image of St. Gemma and a parachute, and additionally he also had printed holy cards with the invocation: "S. Gemma, Protectress of Paratroopers, pray for me." 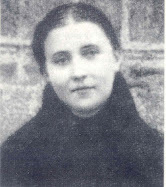 Meanwhile, the young soldiers desired to know more about their new heavenly protector, the sweet Tuscan Saint affectionately known to all as "the Gem of Jesus", so to fulfill this desire the Passionist priests and nuns distributed several copies of "The Life of St Gemma" by her spiritual director, Fr. Germano, along with the holy cards, medals and even a large picture of Gemma, which the paratroopers reverently placed in a most worthy location on the wall of their barracks. Among those brave men there soon was one who was especially protected by their blessed heavenly friend Gemma. In the midst of the war, one of the young paratroopers was on a mission with his fellow soldiers, and after jumping out of the plane, he soon discovered to his horror that his parachute would not open--the greatest fear of all parachutists! Panic stricken, he repeatedly pulled on the rip cord to release the parachute but to no avail. 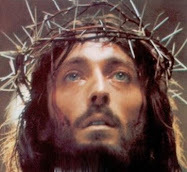 As the seconds passed, he received a flash of inspiration and suddenly invoked Gemma, "St Gemma, please help me!" and pulling on the cord once again, the parachute suddenly opened, saving the young man's life. Upon completion of the mission, the story of their compatriots salvation spread like wildfire amongst the paratroopers, causing even more devotion and thanksgiving to God for the intercession of "their" Saint Gemma. At the church close to their barracks, one would often find fresh flowers and candles placed by the paratroopers next to the picture of St Gemma that had been hung there with devotion. As the war ended and the years passed, the devotion of paratroopers to Gemma continued and spread to lay persons who were enthusiasts of parachuting. 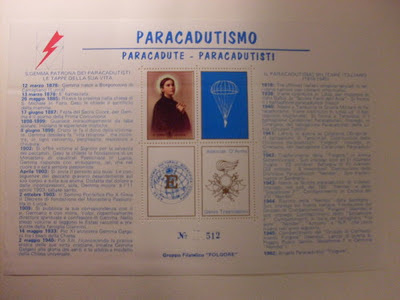 In 1976, The Italian National Parachutists Association sanctioned that S. Gemma Galgani was to be the Patroness of Italian parachutists, while St Michael the archangel would be their Patron. 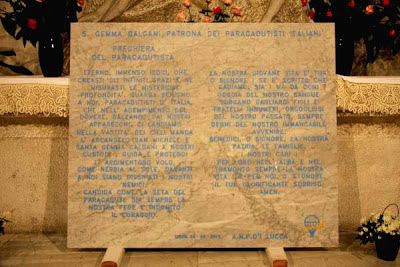 On September 27, 2012 (just a few months prior to this writing) a commemorative plaque which contains the full paratroopers prayer was affixed with great devotion to a wall at the Passionists Monastery-Shrine of St. Gemma in Lucca, Italy. 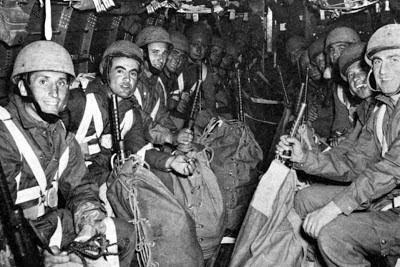 Lord Mighty God who created the infinite spaces and the mysterious depths, look upon us, Paratroopers of Italy, in the fulfillment of duty springing from our planes we set off in the vastness of the heavens. Send the Archangel St. Michael and St. Gemma Galgani to be our guardians to guide and protect our daring flight, so that with our silk white parachute like mist before the sun, we may dissipate our enemies, always with faith and indomitable courage. 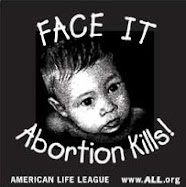 Our young life is yours, O Lord! If it is written that we fall, so be it! But with every drop of our blood may arise innumerable stalwart sons and brothers who are proud of our past and may always be worthy to share in our future. Bless, O Lord, our homeland and our dear families! For them a peaceful dawn and sunset, and for us, O Lord, Thy glorifying smile. Amen. And so it is that the young woman who had never seen an airplane, yet who herself experienced many flights of ecstasy, has become the patroness of paratroopers and parachutists. 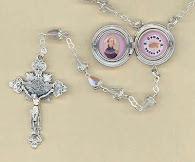 What an amazing story of our sweet St. Gemma. She is truly a gem more precious than all the world's gold! and rest in Him, forevermore. Amen.